Gerhard Isaac Peters: pastor and author; born 11 March 1906 in Hierschau, Molotschna Mennonite Settlement, South Russia. He was the seventh of thirteen children of Isaac F. Peters and Elisabeth (Riediger) Peters. On 19 June 1930 he married Anna "Njunja" Friesen (30 December 1907 - 20 March 1990, Clearbrook, British Columbia, Canada) in Dundurn, Saskatchewan. She was the daughter of Johann J. Friesen (20 July 1874-29 August 1914) and Elizabeth (Dyck) Friesen (25 March 1872-5 January 1914). Gerhard and Anna had three daughters and two sons. On 19 September 1993 Gerhard married Selma Bergen (nee Gerbrandt). Gerhard died in Abbotsford, British Columbia on 16 July 1999. Gerhard's family moved to Bergthal in 1909 where they lived until the Bolshevik Revolution, when they relocated to Landskrone, Molotschna Mennonite Settlement. Gerhard was baptized on 31 May 1925 by Gerhard Plett in the Landskrone Mennonite Church. On 24 October 1925 he arrived in Canada with his parents and siblings, who purchased a 620-acre farm near Grande Pointe, Manitoba. 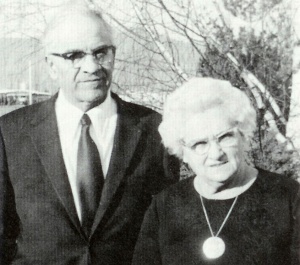 After Gerhard's marriage, he and Anna purchased 160 acres of his parents' farm. They joined the Niverville Mennonite Church and Gerhard taught Sunday school. In 1944 they moved to British Columbia, arriving in the Greendale area of Chilliwack on 14 June 1944. In August 1945 Gerhard was elected by ballot into the ministry at the Sardis (now Greendale) First Mennonite Church and was ordained in November 1946. During the years 1948-50 he attended the Canadian Mennonite Bible College (CMBC) in Winnipeg, Manitoba while his family remained in Greendale. While studying at the college a call came to serve at the Chilliwack First Mennonite Church. He was pastor of the congregation from 1950 to 1959. During this time he continued his studies by correspondence and earned his Bachelor of Theology Degree. Gerhard served the BC Mennonite Church as Youth Leader for 3 years and served on the provincial Mennonite Central Committee Board. In 1952 he became one of the organizers of the Mennonite Benevolent Society in Abbotsford and served as chairman for 14 years. The society was responsible for the building of the Menno Home and the Menno Hospital. In 1956-1957 Gerhard served as moderator for the Conference of Mennonite Churches in BC. Gerhard served three years on the Canadian Mennonite Bible College board. He served nine years in the Canadian Mission Board with regard to building churches in the mission stations in different cities. In this capacity he called on 88 churches in Canada during the winter of 1959-1960. In the Fall of 1960 he started commuting to the United Mennonite Church in Black Creek on Vancouver Island. For two and one-half years Gerhard and Anna visited and served in this church on three Sundays of every month until they were able to find a permanent pastor. From 1963 until 1965 Gerhard served as pastor of the Chilliwack Mennonite Mission Church, a daughter congregation of Chilliwack First Mennonite, and then returned to Greendale First Mennonite where he served as a lay minister. From 1967 to 1971 he served as pastor in the Mennonite Church in Springstein, Manitoba. On his return to British Columbia he served as the board secretary of the Mennonite Benevolent Society and as assistant pastor at Greendale First Mennonite Church. In his later years Gerhard served as vice-president and the Fraser Valley representative for the Persecuted Church Fellowship, a Bible-based, interdenominational faith mission affiliated with the Voice of Eternity mission in Zaporozhie, Ukraine. Gerhard was fluent in German, English and Russian and made numerous trips to the Ukraine in support of this mission. Peters had a strong interest in Mennonite history and was very active in the Mennonite Historical Society of BC. He was also the author of several books dealing with various aspects of Mennonite history including Remember Our Leaders, a tribute to leaders of the Mennonite Church in Canada published in 1982. Guenther, Waldemar, Heidebrecht, David P. and Peters, Gerhard I. "Onsi Tjedils": Ersatzdienst der Mennoniten in Russland unter den Romanows. Yarrow, BC: Columbia Press, 1966. Guenther, Waldemar, Heidebrecht, David P. and Peters, Gerhard I. "Our Guys": Alternate Service for Mennonites in Russia under the Romanows, Peter H. Friesen, trans. Keewatin, ON. : Peter H. Friesen, 1995. Peters, Gerhard Isaac, ed. The Beginning and Work of the Mennonite Benevolent Society in B.C. from 1953 until 1978. Abbotsford, BC: Mennonite Benevolent Society in BC, 1978. Peters, Gerhard Isaac. He Leadeth Me in the Right Path. Abbotsford, BC: Gerhard I. Peters, 1994. Peters, G. I. A History of the First Mennonite Church, Greendale, B.C. Greendale, BC: First Mennonite Church, 1976. Peters, Gerhard I. How God Leads: From the Beautiful Steppes of the Ukraine to the Wonderful Fraser Valley in British Columbia, Canada (The Life of Anna and Gerhard Peters). Sardis, BC: Gerhard I. Peters, 1974. Peters, Gerhard. Njunja: The Little Girl from Franzovka. Abbotsford, BC: Gerhard Peters, 1992. Peters, Gerhard I. Remember our Leaders: Conference of Mennonites in Canada, 1902-1977. Clearbrook, BC: Mennonite Historical Society of British Columbia, 1982. Peters, Siegfried. "Peters, Gerhard I. (1906-1999)." Global Anabaptist Mennonite Encyclopedia Online. July 2005. Web. 26 Apr 2019. http://gameo.org/index.php?title=Peters,_Gerhard_I._(1906-1999)&oldid=114038. Peters, Siegfried. (July 2005). Peters, Gerhard I. (1906-1999). Global Anabaptist Mennonite Encyclopedia Online. Retrieved 26 April 2019, from http://gameo.org/index.php?title=Peters,_Gerhard_I._(1906-1999)&oldid=114038. This page was last modified on 23 February 2014, at 02:12.